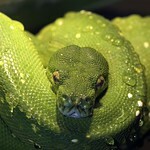 These pythons are vivid green in color, with a broken vertebral stripe of white or dull yellow. Spots of the same color may be scattered over the body. 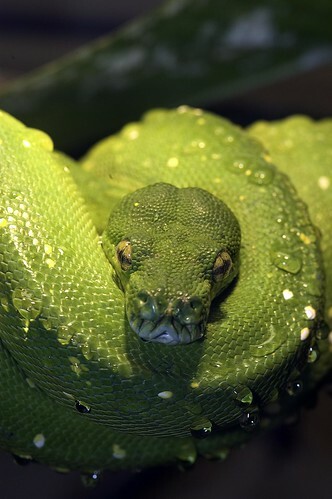 These snakes have been known to reach a length of 7 feet, but the average adult is up to 4 feet long. New Guinea and extreme northeastern Australia (Cape York). Rain forest trees, bushes and shrubs. Completely arboreal. Rodents, birds and probably bats are eaten, sometimes with the snake dangling from its roost, secured by its strong, prehensile tail. 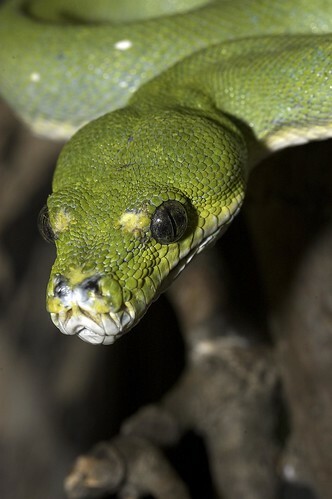 These snakes spend almost their entire lives in the trees. The tree python is oviparous (egg laying), typically incubating and protecting the eggs. Hatchlings are typically lemon yellow with broken stripes and spots of purple and brown. However, red or blue young can often appear in the same clutch as the yellow. The vivid juvenile colors soon change to the adult green. These snakes employ disruptive coloration, which is an excellent camouflage and effects near invisibility. 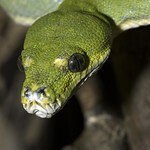 Strong, prehensile tail enables the snake to eat while hanging from a branch.